Hello! It’s Carrie from Lovely Etc. 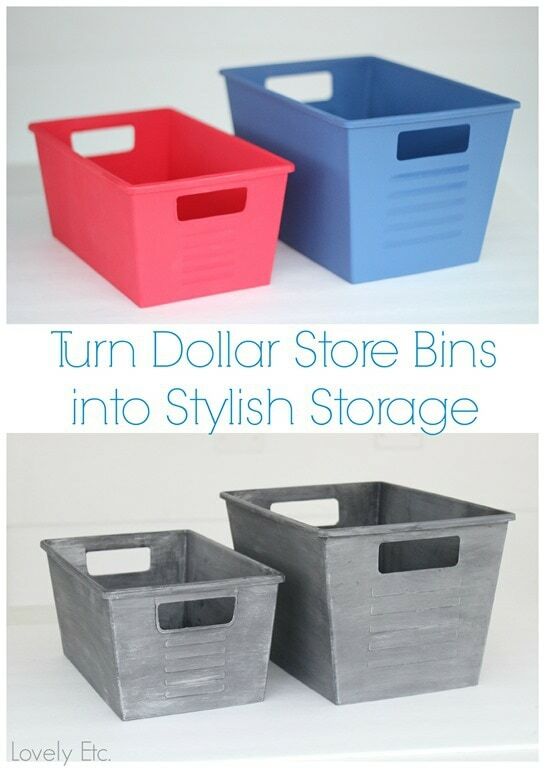 here to share an incredibly inexpensive storage solution with you – turning Dollar Store Bins into Stylish Storage. 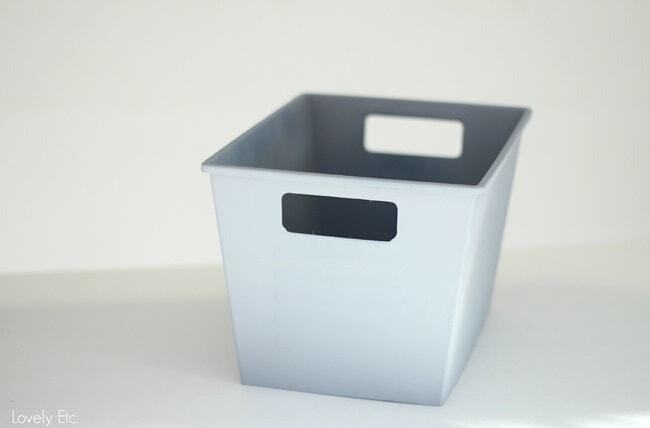 I feel like I can never have enough bins and baskets to keep everything organized – from my son’s blocks to our collection of phone chargers, there is always something that needs to be corralled. 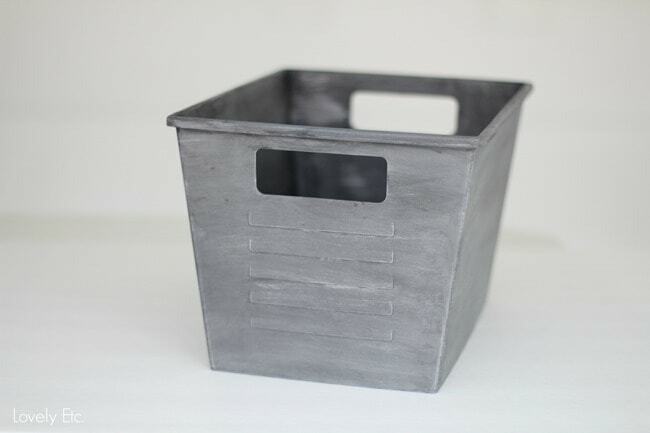 My absolute favorite containers are vintage crates, boxes, and buckets but those aren’t always easy to find and they can get expensive. And if you need a matching pair, you can pretty much forget it. 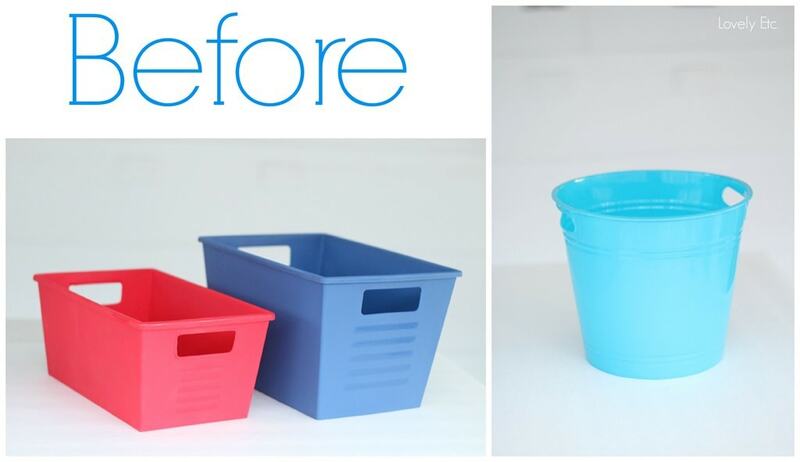 So I set out on a mission to turn some cheap plastic bins from the Dollar Tree into vintage knock offs. 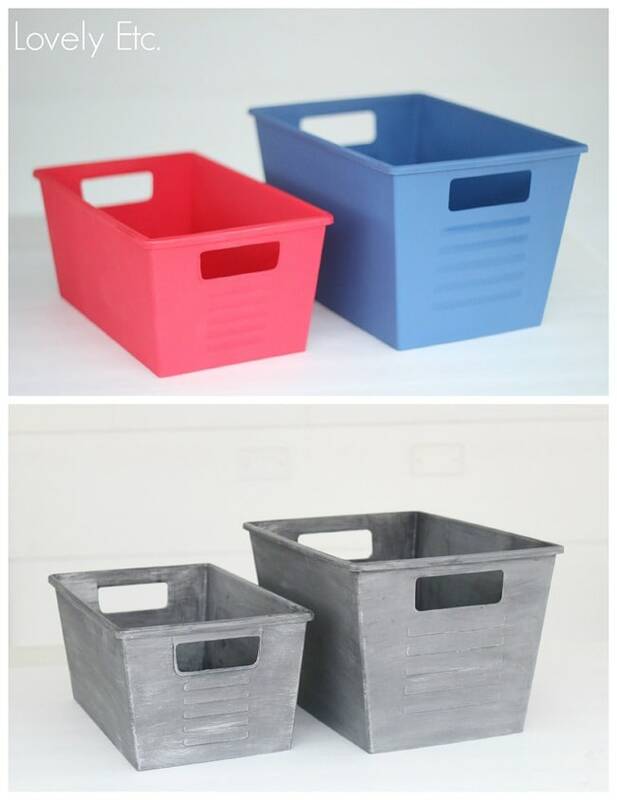 I started with two plastic bins that looks like lockers baskets and a plastic bucket. All in very bright, happy shades that are perfect tucked away in a closet…but not exactly what I would want to use to decorate my house. I really wanted to give them the look of aged metal and I was able to do that pretty simply using only three steps. 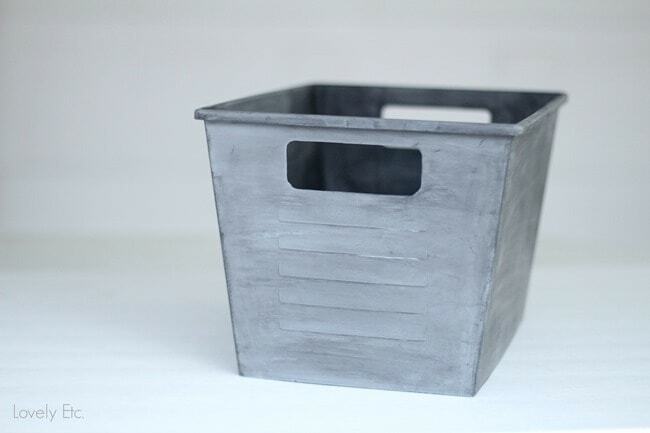 To get a really authentic aged metal look, you need gray automobile primer, chalkboard paint and silver craft paint. because it sticks really well to plastic and gives a great matte gray finish with a bit of texture. to rub a thin coat of chalkboard paint on and then immediately wiped the excess off with an old rag. and a chip brush. I just barely loaded a small amount of silver paint onto the ends of the brush and then wiped the excess off onto a paper towel before lightly dry brushing it onto the bins. The final effect looks pretty authentic to me! And super affordable. The bins and bucket were each a dollar. I had all of the other supplies on hand but even if you had to buy them, you should be able to pick up all three paints for around ten dollars. Not a bad deal – especially if you are planning to do several bins at once. I’m still deciding where these are going to find their permanent homes, but for now I’m using one locker bin to corral some books on our bookcase. 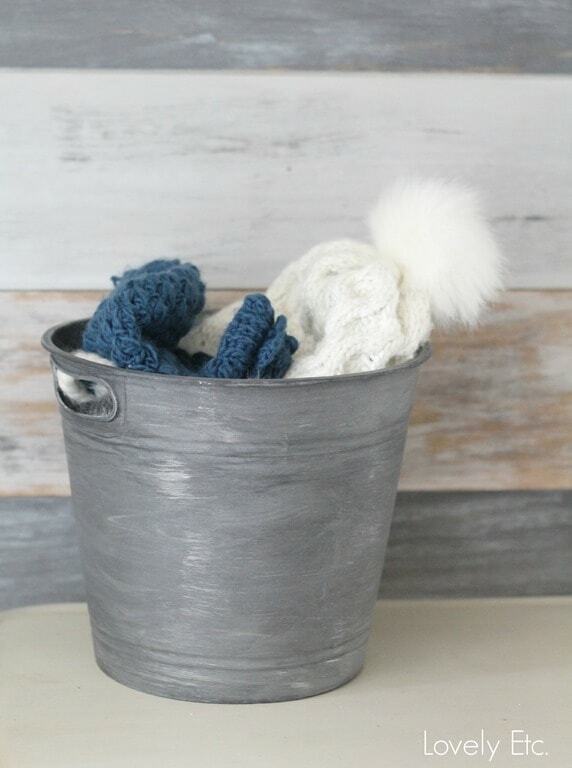 And the bucket is the perfect size to hold our winter hats and mittens. The next time I am at the dollar store, I am definitely going to be looking around with a more open mind, looking at all the possibilities! If you love inexpensive DIY and craft ideas like this one, I’d love for you to follow along with me on Facebook, Instagram, and Pinterest. It’s truly a great and helpful piece of info. I’m satisfied that you shared this useful information with us. What is a chip brush? Great idea! 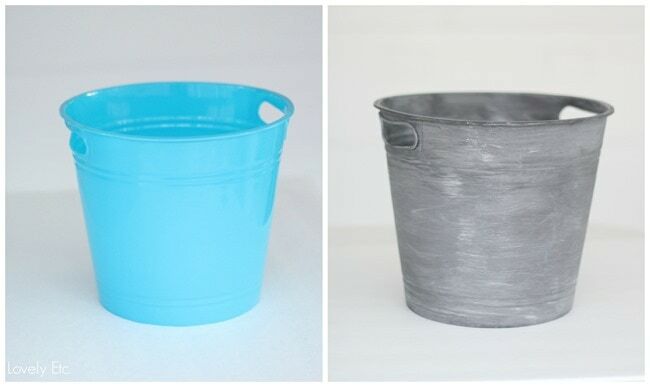 When I first saw the picture I thought, “what cute metal buckets!” I LOVE baskets, buckets and bins and would like my closets to be more “matching” organized, but like you say, the cute ones get so expensive. This is a great idea. Thanks! How well does the paint hold up on plastic with everyday use. How frequently do you need to touch up or reapply? Often I’ve seen bins I’d like (size) but not color – love this idea! Hello Maryann! This is my first time here. Thanks for sharing your idea! Great idea and I love the auto primer! Wow! so cool! They look like galvanized metal! Going to use this idea! THANKS!! They look very nice ! I love this scratch effect! Thanks for sharing! The ideas is great! Hello Maryann:) This is my first time visiting your blog! Very nice:) I’ll definitely be coming back! 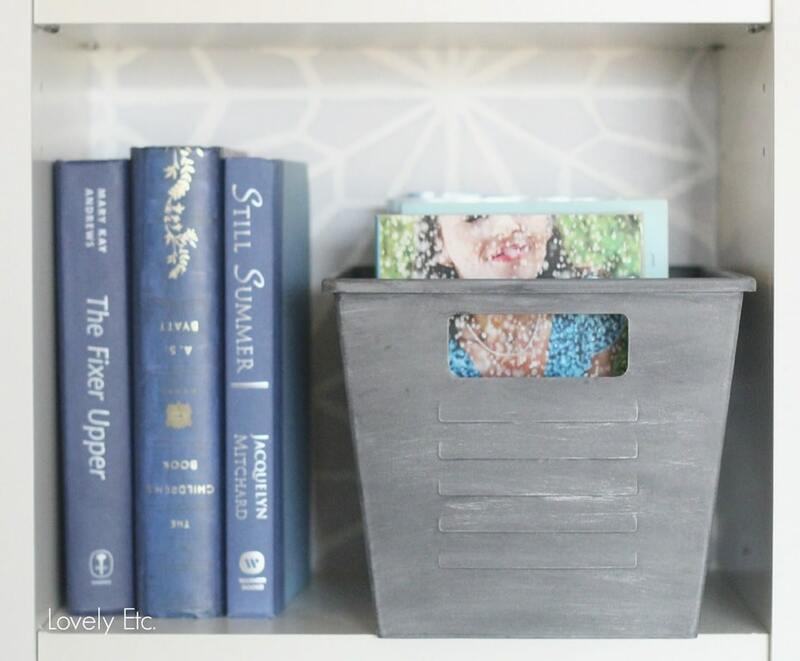 I love this budget idea….genius:) Thanks for sharing!